Spare, rhyming text and detailed artwork inform readers about the life cycle of a sycamore tree, from seed to maturity—and its role in the ecosystem. “It starts with a seed,” proclaims the dark ink across from art that shows one helicopter seed in the foreground, dozens gently falling in the background, and a small line of stubble at the bottom, representing the ground. High-quality, cream-colored paper, pencil-framed margins, a well-chosen palette, and excellent use of negative space begin here and continue throughout. The poem continues over two more page turns: “But where does it lead? // To a root, to a shoot, / to a few tiny leaves.” Exquisite, naturalistically rendered ink-and-watercolor art encourages readers to pause at each double-page spread. As the tree ages—and subtly shows a hint of sentience—more and more animals assemble in its branches and in the ground surrounding its roots. An abundance of nouns, verbs, and adjectives describing the tree’s growth effortlessly increases vocabularies, spread by spread and stanza by stanza. At the end, a foldout uses one page to re-create the entire text as one poem and then offers more information, in prose, about sycamores. 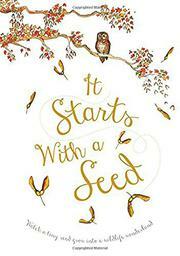 While giving a general idea of how one journey from seed to tree influences an entire ecosystem, the text also emphasizes the wonder of growth—and life—itself. The tone is soothing and reverential.